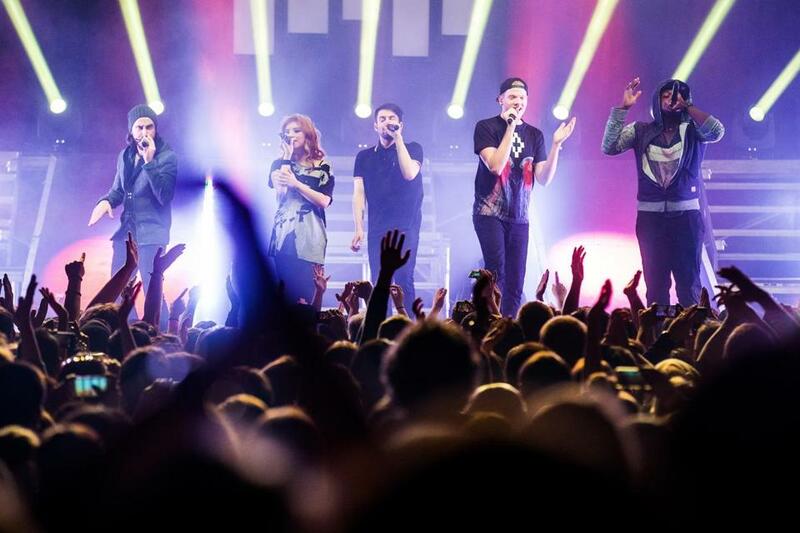 A cappella group Pentatonix performing the first of two sold-out shows at the House of Blues on Saturday. It could be argued that Pentatonix is simply riding a wave of a cappella enthusiasm that has seen “Glee,” “The Sing-Off” (the group won the show’s third season) and “Pitch Perfect” make not-insubstantial pop-culture impacts in recent years. But timing alone can’t explain the quintet’s rock-star reception — complete with serenaded audience member overcome with freaked-out terror-joy — on Saturday at the first of two sold-out House of Blues shows. The fact of the matter is that Pentatonix is extremely good at what it does. The group’s meticulousness was unmistakable, so much so that the democratic invitations for audience participation counterproductively undid the tightly packed arrangements. There was madrigal complexity, swing-jazz harmonies and vocals shooting across the stage from singer to singer like an auditory magic trick. Pentatonix’s rhythm was as precise as its pitch, if not more. It stopped and started on a dime countless times, and the group constantly pivoted as one. It was so seemingly effortless that it occasionally served as a crutch. Two medleys, one of Beyoncé material and one of random pop through the decades (with some overlap between the two), moved so briskly from song to song with no apparent musical thread that they weren’t much more than nods of recognition and displays of Pentatonix’s ability to shift quickly. A Daft Punk medley was more successful by finding ways to put just a few songs in conversation with one another. Another original, “Love Again,” simultaneously showed the breadth of Pentatonix’s imagination and, ironically, the limits of it. It was pitch-perfect EDM, complete with whooshes and a dubstep breakdown, and it wasn’t clear if it debunked the perceived lack of humanity in that genre or decried the dehumanizing mechanical precision of a cappella. Right then, Pentatonix proved that it could do anything instrumental arrangements are capable of. What it needs to show is what a cappella alone can do.